The modern workforce is changing, with more workers than ever a part of the gig economy, starting their own small business, or working remotely. The standard nine-to-five day at the office is evolving as workers have increased options on where they want to work - basically, anywhere WiFi is available. While Arlington is known for its robust entertainment district, it’s not all play and no work in the American Dream City. Many places across town are making freelance or remote work a breeze. Whether you’re looking for a quiet place to scan and review documents or a chill atmosphere with plenty of coffee, Arlington has it all. Urban Alchemy is a great place to start or finish your work day - depending on if your in the mood for a latte or a cold brew. The coffee and wine bar features the best of both worlds, along with a full menu all day. The coffee is top-notch, with everything from bottomless drip coffee to personalized macchiatos. If you’re ending your day here, you can indulge in a variety of wines as well as beer from several local breweries. The space is decked out with comfy couches and a gorgeous wooden bar, giving you plenty of seating options. They also have large tables in the back that offer a bit more privacy if you want to spread out your work and get down to business. Forget finding a place to work for a second, let your inner Belle roam free amongst the magnitude of books available at the new downtown Arlington Public Library. Now that you’ve scooped your favorite new fiction read, the library has all the tech you could need to get your job done. If you’re on your own, check out the gorgeous rooftop garden, where you can finalize proposals or build spreadsheets all while taking in the scenic views of downtown Arlington. If you want to work with a group or need to meet local clients, you can book meeting and study rooms - all you need to do is sign-up for a *free* library card. With a bevy of space, quiet and technology, the library is an ideal spot to work. I have spent many an hour drinking milk tea and studying here. Just a short walk from UTA, iCafe is a hidden gem beloved by students and staff alike. 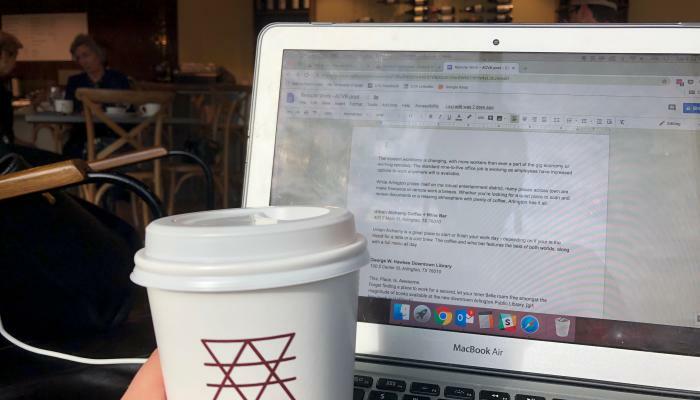 Its low-key vibe and free WiFi make it a perfect spot to hunker down and work - whether it be to study for finals or finish an upcoming presentation. Grab a sushi roll or a bite of one of their other Japanese-style dishes for some brain food - my favorite is the classic pork katsu. Despite having a steady stream of customers all day, iCafe remains fairly quiet and peaceful. Grab your laptop and have your tea order ready before heading to this tasty remote work location. Owned by a husband/wife duo, this brand new co-working space finds its home in the Urban Union complex of Downtown Arlington, and is beautifully designed for “entrepreneurs, freelancers, startups, creators, work from homers and anyone who wants to take their dream out of the spare bedroom.” This membership-based space not only has flexible office space, but dedicated desks, unique event event space for meetings and a great color scheme. #LocalVibes: Hillary specializes in all things digital for UT Arlington. She enjoys tacos, her two dogs and binge-watching whatever is on HBO.